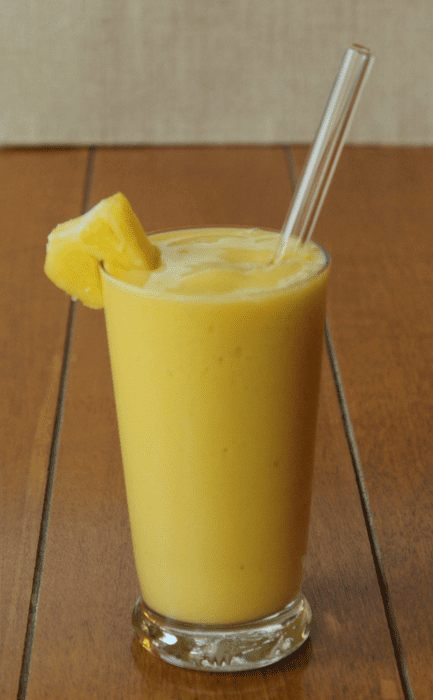 When the weather starts to heat up and you start to feel like you might never be able to live without air conditioning, it’s time to break out the healthy summer smoothie recipes, like this Pineapple and Mango Smoothie. It’s chock-full of delicious fruit and is dairy and sugar-free, so it’s great for kids and adults that want to stick to a healthy eating plan during the summer, but it still tastes like a thick, frozen, fruity milkshake. This smoothie recipe is actually an attempt to copy one of the most delicious pre-packaged smoothie kits I had ever had. It’s actually pretty close to the original, which I’m so happy about, because the originals aren’t available any longer. At the beginning of the year, I found this healthy smoothie pack at my local Aldi store. It had both fruit and veggies inside, and looked like a good option for a healthy smoothie. Unfortunately, I didn’t use the smoothie pack right away. It probably sat in my freezer for a good 4-5 months, because it had really been too cold to drink a frozen smoothie until late spring. When I finally did use this smoothie pack, I loved how delicious the drink was and made a note to pick up some more the next time I went to Aldi. But, if you know Aldi, you know that they often carry seasonal items, which are only around for a few weeks at a time. That was the case with this smoothie pack, and so I had to try to recreate it for myself. 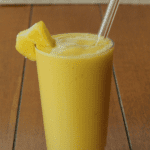 This pineapple and mango smoothie actually contains 4 fruits: pineapple, mango, mandarin oranges, and banana. The original smoothie pack also contained sweet potato, but I opted to leave that out so that I didn’t have to pre-cook anything. 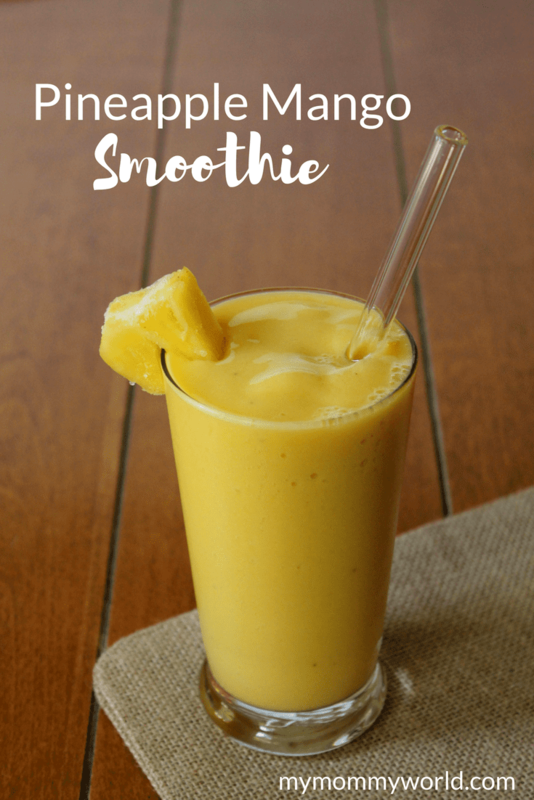 A day or two before I want to make this smoothie, I get a big pineapple, cut it into bite-size chunks, place them into a freezer bag and place into the freezer. I did the same with some clementine/mandarin oranges. I did choose to buy pre-frozen mango chunks at the grocery store, however, because it was a less expensive option than buying a bunch of mangoes, which don’t yield a lot after you cut out the hard centers. The last of the smoothie ingredients are unsweetened almond milk and sweetener. I use Super Sweet Blend (affiliate link) from Trim Healthy Mama, because I eat sugar-free, but you can use any type of sweetener you like. 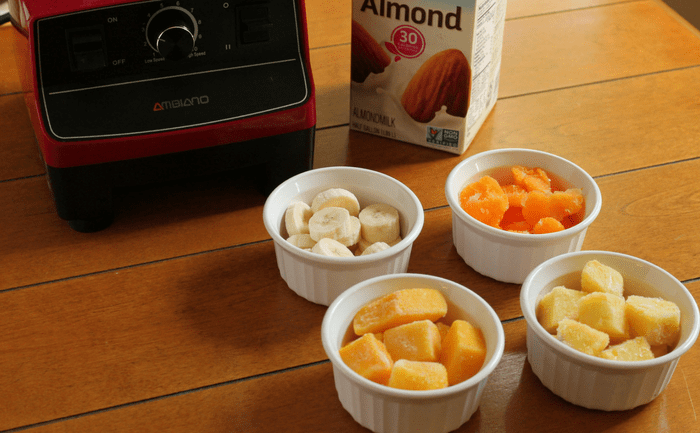 Place about 1 cup of the almond milk into a blender, along with 1 cup each frozen pineapple chunks, frozen mango chunks and frozen mandarin oranges. Add 1 sliced banana and 1 teaspoon of Super Sweet Blend. Blend the mixture until smooth. You can add a few ice cubes if you like your smoothies extra thick. I sometimes add a 1/2 to 1 scoop of THM whey protein powder to the smoothie if I want to use it as my breakfast or a heavy snack in the afternoons. Just add the protein powder after all the fruit and ice are blended, turning the blender back on for 5 to 10 seconds. Pour almond milk into the bottom of the blender. Add the fruit and sweetener. Blend until smooth. Add ice cubes, if desired, and blend until smooth. Add protein powder, if desired, after everything is well-blended; blend again for 5-10 seconds. This smoothie looks delicious. I agree that mangos yield such a small amount and I would opt for the pre-frozen variety too. I’m pinning this for later. This smoothie looks so refreshing! Thanks for linking up to the Ultimate Pinterest Party last week, I featured your post in this weeks party. Hi Ali! Thanks so much for stopping by 🙂 And thanks for featuring my post…it’s so exciting! I hope all your readers will love it as much as we do.